CO2 alarmists want to use Doggerland as a morality tale to scare us about rising sea levels in this century and the next. Because it certainly demonstrates the perils of climate change. As usual though, they fail to put the past into an historical context, because that would destroy their narrative. First, what is the story of Doggerland? The most rapid rises of sea level were on the order of three to six feet a century, but because of the variable topography of the land, the flooding would not have been even. In areas as flat as modern-day East Anglia, a six-foot rise could have shifted the coast inland by miles; in hillier places, less. Down in low-lying Doggerland, the rising sea turned inland lakes into estuaries. Gaffney’s digital reconstruction shows that one in particular, the Outer Silver Pit, contains massive sandbanks that could only have been created by fierce tidal currents. At some point the currents would have made it dangerous to cross in a log boat, and eventually, created a permanent barrier to once familiar hunting grounds. Alarmists like Jim Hansen are calling for sea levels to rise 3 to 6 feet this century, even 10 feet on an especially feverish day. But when those rates happened, there were no fossil fuel emissions. Moreover, that amount of rise is not happening any more. 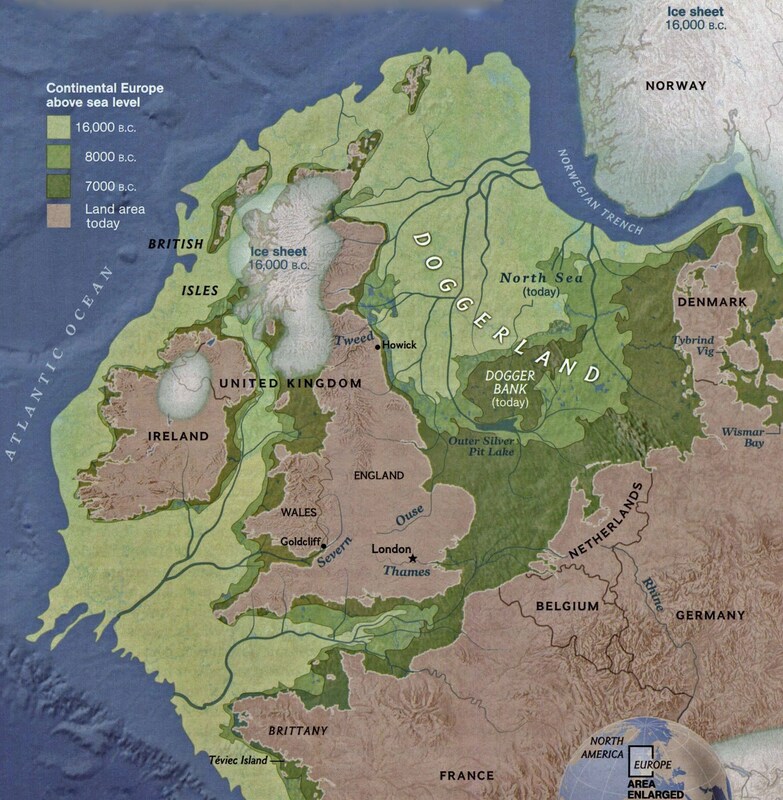 The flooding of Doggerland coincides with the rapid sea level rise up to about 8000 years ago, and the modern farming period beginning about 6000 years ago. Sea level has been gently rising a few mm/year up to the present, including the recovery from the Little Ice Age. Of course anything is possible, but without an acceleration unprecedented in the last 6000 years, the rise will be about a foot/century. 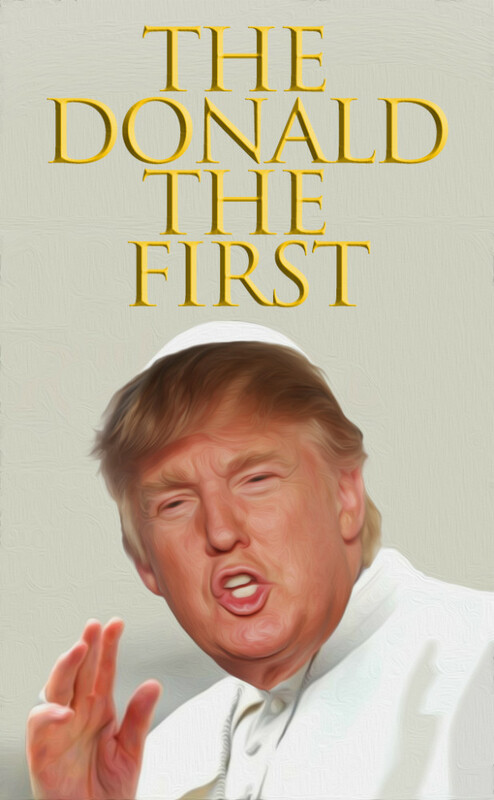 So anyway, that was my first experience at Mass, folks, and I almost left to tell you the truth. This Mass was bad, I almost left, but then someone told me that this was the “New Mass.” Apparently there was an “Old Mass” and now there is a “New Mass” it’s called the Novus Ordo have you heard of it? 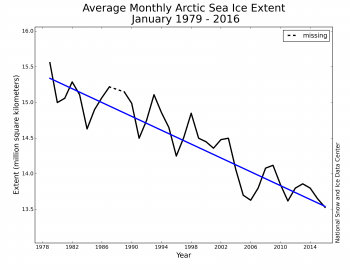 Something strange is happening in the reporting of sea ice extents in the Arctic. I am not suggesting that “Something is rotten in the state of Denmark.” That issue about a Danish graph seems to be subsiding, though there are unresolved questions. What if the 30% DMI graph is overestimating and the 15% DMI graph is underestimating? The monthly average January 2016 sea ice extent was the lowest in the satellite record, 90,000 square kilometers (35,000 square miles) below the previous record low in 2011. Why the Discrepancy between SII and MASIE? Passive microwave sensors have produced a 35 year record of sea-ice concentration variability and change. Operational analyses combine a variety of remote-sensing inputs and other sources via manual integration to create high-resolution, accurate charts of ice conditions in support of navigation and operational forecast models. One such product is the daily Multisensor Analyzed Sea Ice Extent (MASIE). The higher spatial resolution along with multiple input data and manual analysis potentially provide more precise mapping of the ice edge than passive microwave estimates. However, since MASIE is based on an operational product, estimates may be inconsistent over time due to variations in input data quality and availability. Comparisons indicate that MASIE shows higher Arctic-wide extent values throughout most of the year, largely because of the limitations of passive microwave sensors in some conditions (e.g. surface melt). However, during some parts of the year, MASIE tends to indicate less ice than estimated by passive microwave sensors. These comparisons yield a better understanding of operational and research sea-ice data products; this in turn has important implications for their use in climate and weather models. The whole document is informative and worth the read. Human analysis of all available input imagery, including visible/infrared, SAR, scatterometer and passive microwave, yields a daily map of sea-ice extent at a 4 km gridded resolution, with a 40% concentration threshold for the presence of sea ice. In other words, if a gridcell is judged by an analyst to have >40% of its area covered with ice, it is classified as ice; if a cell has <40% ice, it is classified as open water. The passive microwave sea-ice algorithms are capable of distinguishing three surface types (one water and two ice), and the standard algorithms are calibrated for thick first-year and multi-year ice (Cavalieri, 1994). When thin ice is present, the algorithms underestimate the concentration of new and thin ice, and when such ice is present in lower concentrations they may detect only open water. The underestimation of concentration and extent of thin-ice regions has been noted in several evaluation studies. . .Melt is another well-known cause of underestimation of sea ice by passive microwave sensors. The paper by Meier et al. 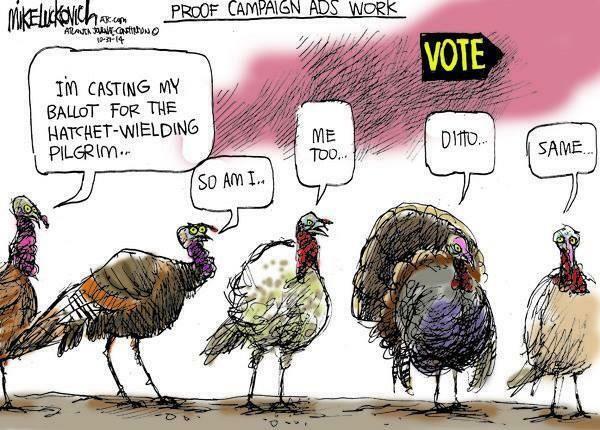 is a good analysis, as far as it goes. In this post I will show the gory details and bring the comparison up to date. The green line shows the SII deficit to MASIE each month averaged over the last 10 years. The red line shows a cumulative surplus of ice reported by MASIE running through the 12 months, averaged over the last 10 years. Clearly, the graph shows SII underestimates ice extent most of the year, but by September the discrepancy is minimal. Then a huge surplus of ice is reported by SII each October, which results in SII reporting a higher annual extent than MASIE. But look at what is happening recently. The blue line shows the SII monthly deficit to MASIE in 2015, while the purple line shows the MASIE surplus during 2015. SII last year underestimated extents more than previously, and with a smaller correction in October, MASIE shows an annual surplus, the cumulative divergence for 2015 is about 2M km2 above the 10 year average. And in 2016, SII results are increasingly untrustworthy. January 2016 is 450k km2 down, and February (so far) is 600k km2 less than MASIE. It is unwise to rely on NOAA’s Sea Ice Index as a sole measurement of Arctic ice extent. The October SII readings are unbelievable, and resemble an adjustment applied to bring the annual results into line. The MASIE record is good enough for Walter Meier to analyze it with the objective of making SII closer to MASIE’s accuracy. CBC created some controversy by switching headlines on its report of the findings. I’m wondering what really was learned from this survey. With any survey, it is important to look at the actual questions asked and answered. While we do not have access to specific responses, the script for the telephone interviews is available. The first two questions asked about global warming (not climate change). Our results reveal, for the first time, the enormous diversity of Canadian climate and energy opinions at the local level. At the national level, 79% of Canadians believe climate change is happening but only 44% think climate change is caused mostly by human activities. So the 79% who said there’s solid evidence of warming the last 40 years got a followup question: mostly caused by human activity or mostly natural? Slightly more than half said mostly human, thus a result of 44% believing both that it is warming and that humans are mostly to blame. Now some people were unwilling to decide between mostly human and mostly natural, and volunteered that it was a combination. This fraction of respondents was recorded as partially human caused, and they added 17% to bring the number up to 61%. The remaining 39% combines people who don’t accept evidence on warming and those who think warming is mostly natural or are uncertain about both issues. From having done opinion surveys in the past, I suspect that many who were uncertain between human or natural causes didn’t want to say “don’t know”, and instead said it was a “combination”. Thus the group counted as “partially human-caused” is a soft number. My suspicions are reinforced by a question that was asked and not included in this report: “How much do you feel you know about global warming?” Typically about 25% say they know a lot, 60% say they know a little, and the rest less than a little. As we know from other researchers more climate knowledge increases skepticism for many, so it is likely the soft number includes many who feel they really don’t know. 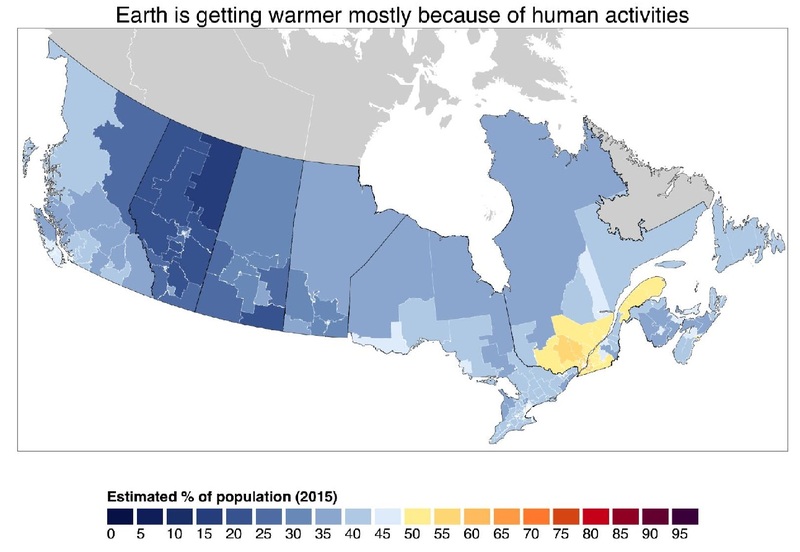 Yes, the map shows I am living in a hotbed of global warming believers around Montreal; well, it is 55%, as high as it gets in Canada. 3. “There is a proposed system called cap and trade where the government issues permits limiting the amount of greenhouse gases companies can put out. If a company exceeds their limit, they will have to buy more permits. If they don’t use all of their permits, they will be able to sell or trade them to others who exceed their cap. The idea is that companies will find ways to put out less greenhouse gases because that would be cheaper than buying permits. Despite this variation in core beliefs about climate change, we find widespread public support for climate policies. Support is greatest and most consistent for emissions trading. . . The overall pattern is clear: there is majority support for emissions trading in every Canadian district. We find larger variation in support for a carbon tax across the country. At the national level, support for carbon taxation at 49% is just below a majority, with opposition at 44%. Now here is the underlying motivation for the survey: to determine the level of support in the Canadian population for government action to increase the price of carbon-based energy. Not surprisingly, people who mostly know only a little about this like the sound of companies footing the bill for policies, more than the government raising my taxes. With a little more knowledge they will understand that cap and trade increases the cost of energy within all of the products and services they use, and therefore raises the price of pretty much everything. It is a hidden tax completely without accountability. Thanks to the Social Sciences and Humanities Research Council of Canada, the Fonds de Recherche du Québec – Société et Culture, the Skoll Global Threats Fund, the Energy Foundation, and the Grantham Foundation for the Protection of the Environment for financial support. Funding for individual survey waves was provided by the Ministère des Relations internationales et de la Francophonie, the Public Policy Forum, Sustainable Prosperity, Canada 2020, l’Institut de l’énergie Trottier and la Chaire d’études politiques et économiques américaines. 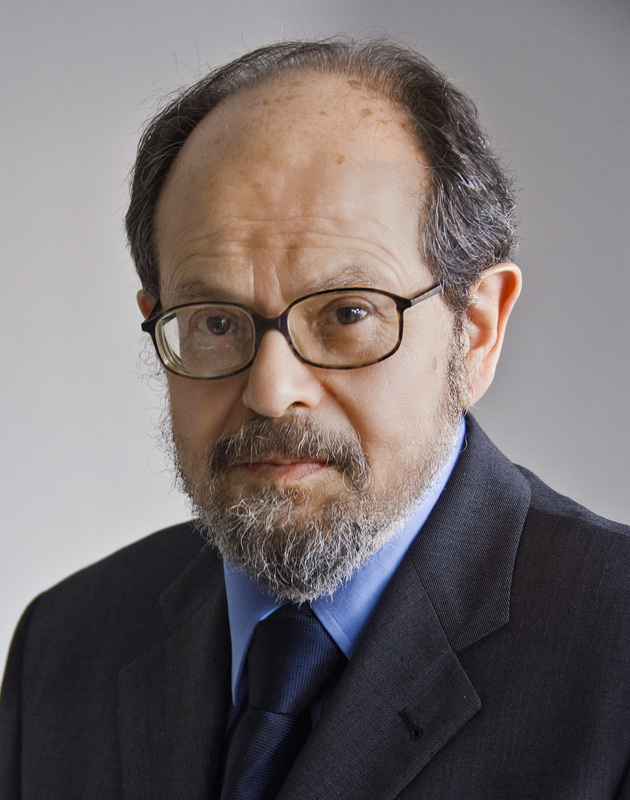 Earlier this month, atmospheric physicist and professor emeritus at MIT Richard Lindzen was interviewed by radio host William Frezza, and here is a transcript of that interview. Thanks to Alec Cull and Climate Scepticism for the transcript. Below are some excerpts, but the whole read is worth it. If you want a daily measurement, do you take a 6 pm minus 6 am or 12 versus 12, or so on? It all makes a difference – doesn’t make a big difference for the purpose for which these measurements were made, which was not climate. It was for weather forecasting. And if you look at a weather forecast, you don’t care if it changed two tenths of a degree – you couldn’t measure that, you couldn’t feel that. You want to know: did it go up 10 degrees, 20 degrees, you know – is a cold front coming through? So, for those purposes, for weather forecasts and so on, for people’s lives, these measurements were adequate. By definition, if they’re reporting on global mean temperature anomaly, which is what they use, of course it involves adjustments. You have to process this, you have to take the average, you have to move from it. They also do have adjustments – we know that urban areas introduce warmth and they have formulas that they design to quote correct for it. And again, the problem is not that this is illegitimate but that if you’re worried about tenths of a degree, it’s totally inadequate. The virtue of the satellites is of course they have global coverage. 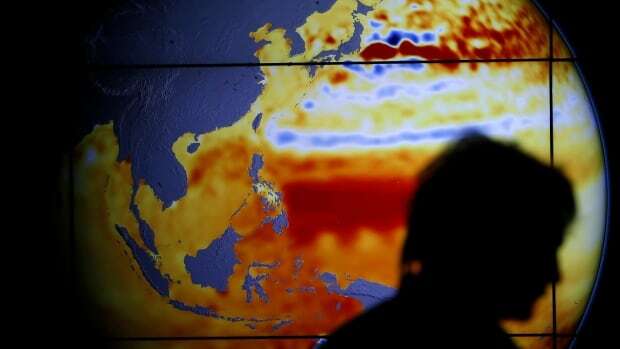 The thermometers have very poor coverage over the oceans – 70% of the Earth. They are not measuring exactly the same thing. They are more consistent over time, but even there, there are many things to correct for – the orbital decay, the other things – and so they also have their own corrections. They are more nearly, I would say, corrections than adjustments, but, you know, there’s semantics mixed in. You see, the existing models, for instance, if you restrict yourself to this global mean temperature anomaly – one variable, the others may be way off, but let’s take that one – if they predict too much increase in temperature, they have thus far added aerosols and said those cancel it. So they adjust it to look like the period they – it’s a little like taking an exam and being told the answer in advance. But the bigger test is: run models forward. And if you do that, virtually every model used by the UN, from 1978 to the present, is overestimating the observed change in temperature..
Look, you look at the temperature records for the ground, from the satellites, for anything. And what you see is something flopping around a few tenths of a degree, but no obvious trend for at least 18 years. Now, people are then saying “Well, if I take 2015 and it’s a tenth or two higher than ’98, or something like that, now I can draw a trend line through this that makes it look like it went up a tenth or two of a degree.” The problem with that is: if something is flopping around with a zero mean, and you pick your end points selectively, you can get it go up, get it go down… It’s a distraction. So all scientists agree that it’s probably warmer now than it was at the end of the Little Ice Age. Almost all scientists agree that adding CO2 should give you some warming, though it might be very little. But it is propagandists who translate that into “It is dangerous – we must reduce CO2”, etc. That doesn’t even come from the IPCC scientific assessment. But within the science community, the real division is much more subtle. So I would say IPCC Working Group I, which is the scientific assessment – the general position they adopt is that there is warming, it is mostly due to man in recent years – meaning since about 1960, 1970, not before – and it is potentially dangerous. Okay. And the sceptical position is: there are many causes of the change and it doesn’t look like the sensitivity is enough for it to be serious. So, you know, this is a discussable issue. Neither side is saying catastrophe is round the corner. Government has a monopoly. Science in this country is funded by the government, and that has its implications. Dwight Eisenhower picked this up, many many years ago, when he said, you know, one of the dangers of this is a government contract might be a replacement for scientific results. And indeed, you know, when you get letters asking for letters of recommendation for promotion, some things like that, very often the question is “What kind of fund-raising can we expect from this person?” So these are by no means minor considerations, and young people know that, that they have to bring in funds. This becomes even more important in modern universities, where the area of major growth has been administration. Good Health and Long Life, Dr. Richard Lindzen. We need your wisdom and character now more than ever. 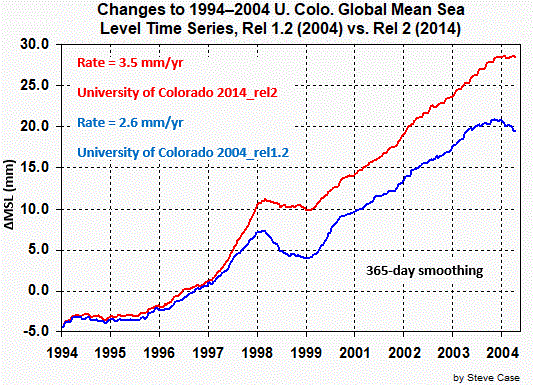 Sea-level didn’t actually rise 3.39 mm last year, at the coasts. That 3.39 mm number is from satellite altimetry measurements of the open ocean, inflated by the addition of model-derived GIA estimates. It has little relation to anything that matters. Sea-level rise only matters at the coasts, but satellite altimeters are incapable of measuring sea-level at the coasts. Tide gauges measure sea-level at the coasts, where it matters, and their data is of much higher quality. The best tide-gauge records of sea-level measurements are nearly ten times as long as the combined satellite measurement record, and twenty times as long as any single satellite measurement record, and the tide-gauge records are trustworthy. 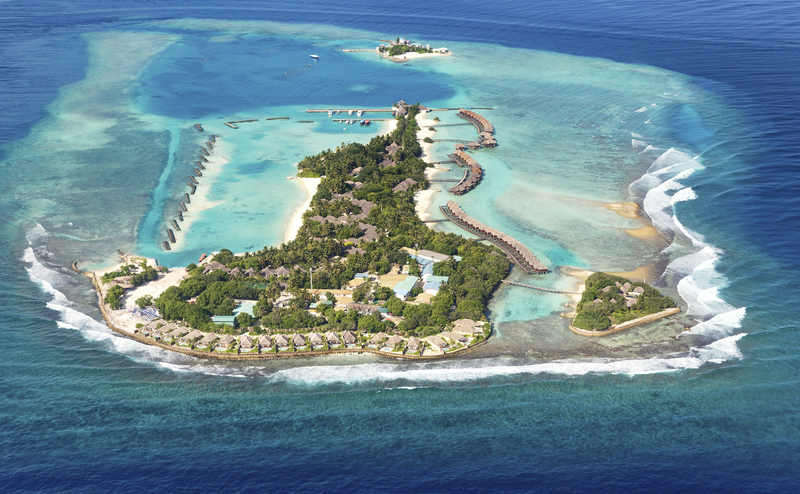 The satellite measurements of sea-level are not. They are subject to a long list of potential distortions, and vary considerably from one satellite to another. The Envisat numbers were revised even more dramatically. Subsequent revisions to data up to ten years after it was recorded approximately tripled the rate of sea-level rise “measured” by Envisat. NASA is aware of the problems with satellite measurements, and they’ve proposed a new mission called the Geodetic Reference Antenna in SPace (GRASP) to try to improve matters. However, that mission has not been funded. My bolding is to draw attention to the basis in models not observations. Further they say half the projected rise is due to thermal expansion which is a local effect not appearing at the coastline or on tidal gauges. NSIDC has received support to develop MASIE ice extent but not to maintain MASIE. We are actively seeking support to maintain the product over the long term. If you find MASIE helpful, please let us know with a quick message to NSIDC User Services. Your dataset is invaluable since it represents multiple sources, including satellite passive microwave sensors, and is more precise in defining ice edges. I have been following MASIE for years, and was pleased to see the dataset for the last ten years released in November 2015. This ice extent record based on navigational observations is a vital resource for comparisons, not only with the satellite measurements, but also with the longer-term history of ice charts from Russia, Denmark, Norway and Canada. Thank you, and please keep up the excellent work. I received a nice reply and word that my message was forwarded to the team leader. Any others wanting to see this dataset maintained might also want to communicate their interest. Needless to say, “Ice Free” never happened. It is true that in the last ten years, August and September monthly extents declined slightly, but the other ten months have increased more than twice as much. So the over all trend has been slightly upward. The comparable MASIE image is showing about 500k km2 more ice than the NASA image. Through mid February, 2016 is following the average winter ice growth over the last ten years, and is greater than 2015 which had a maximum below average. The NSIDC Ice Index is running behind MASIE by about 600k km2. It remains to be seen in March how this year’s maximum will compare to other years. MASIE: Human analysis of all available input imagery, including visible/infrared, SAR, scatterometer and passive microwave, yields a daily map of sea-ice extent at a 4 km gridded resolution, with a 40% concentration threshold for the presence of sea ice. In other words, if a gridcell is judged by an analyst to have >40% of its area covered with ice, it is classified as ice; if a cell has <40% ice, it is classified as open water. Melt is another well-known cause of underestimation of sea ice by passive microwave sensors. N2 is IR-Active: This Changes Everything! E.M. Smith (Chiefio) has new post (here) presenting the evidence showing how Nitrogen, the dominant gas in the atmosphere, also radiates in the infrared, and thus participates in the “greenhouse” effect. This information was measured and reported as long ago as 1944, but the implications have been ignored in the recent obsession with CO2. Footnote: The original discovery of this effect from Nitrogen (here) attributes the IR to N atoms present in the upper atmosphere. 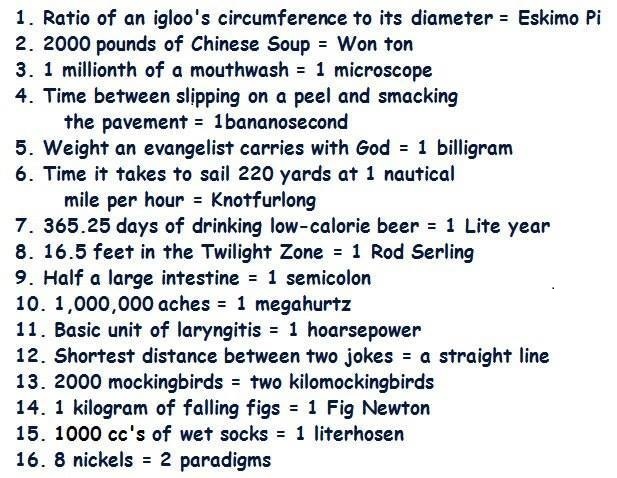 Science depends on measuring things, so you need to know the correct units for what you are studying. Below are some obscure measures for special situations.